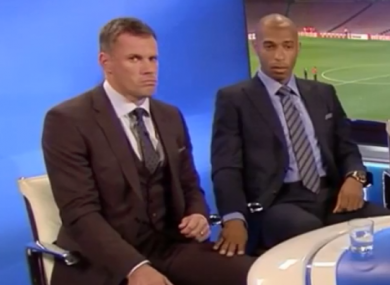 Henry's reaction to the news Liverpool had sacked Brendan Rodgers caught the eye of many. BELGIUM’S THRILLING RUN to a third-place finish at the World Cup appears to have stirred Thierry Henry’s ambition. The Frenchman, who has been a regular pundit on Sky Sports for the past four years, this afternoon tweeted that he will leave that role in order to advance his career as a coach and manager. Henry has worked as assistant to Belgium boss Roberto Martinez since 2016, the intermittent nature of international football allowing the 40-year-old to juggle both commitments. However, today Henry says he will devote ‘more time on the pitch’. “Over the last four years I have had some extremely rewarding coaching experiences in football,” Henry tweeted. “These experiences have only made me more determined to fulfill my long-term ambition to become a football manager. Email “Thierry Henry walks away from Sky punditry job to chase 'long term ambition' of being a manager”. Feedback on “Thierry Henry walks away from Sky punditry job to chase 'long term ambition' of being a manager”.